I am hanging these outside on my Gazebo. They are heavy so that they will hang nicely, yet they can still be pulled back. They are true to color, very pretty blue. Well made, loops are reinforced as to not tear from the wind, while hanging outside. 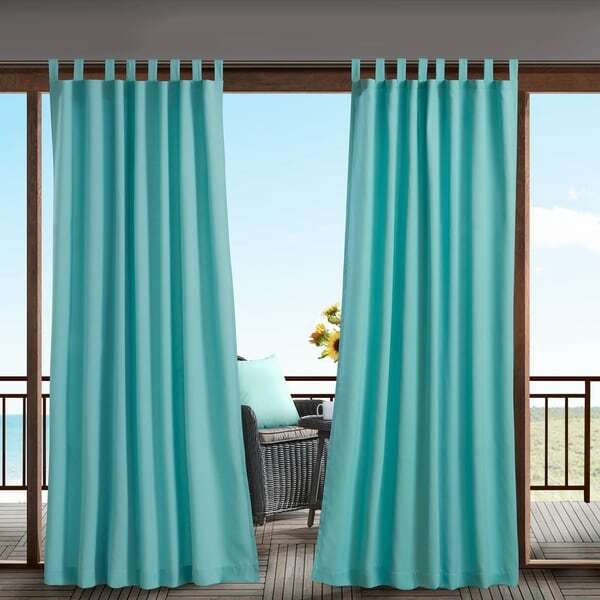 Revive your outdoor space with the weather resistant Cannon 3M Scotchgard outdoor curtain bringing fresh color and style to the decor, while providing long lasting protection. 3M Scotchgard treatment helps repel moisture, resist staining, and provide a durable water barrier that keeps fabric drier longer. Simply hang with tab tops to stylishly separate the space, enhance privacy, or filter the right amount of light for comfort. Machine washable for easy care; this panel requires washing before use due to the nature of the fabric; will soften after wash.